Tapas in Taiwan: easy to say, hard to imagine. 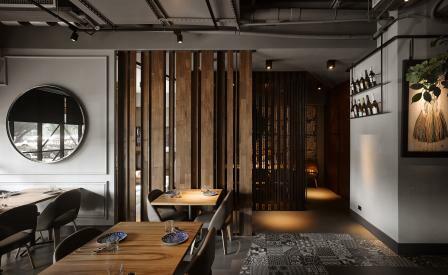 And yet Hsinchu City’s Go Eat Tapas Dining Bar has managed to pull it off. Opting for elegance and intimacy, over like-for-like authenticity, Taipei-based studio tAMINN Design has created a restaurant that is a symphony of light and dark greys which seamlessly harmonise with beige and putty-coloured leather chairs. The earthy surroundings created by wooden wall panelling and tables, is further enhanced by screens made from vertically composed slats of wood that divide the restaurant’s various areas — with 205 sq m to play with, each nook of the space is in possession of its own personality. Clever lighting keeps the mood subdued and sensual; reflective spherical pendant lighting dots the ceiling and elsewhere spotlights gently illuminate choice areas. Faded ceramic tiles sporadically placed on walls and floors, a wine barrel and small trees throughout are subtle hints of of the restaurant’s Mediterranean origins, while exposed brickwork juxtaposed against smooth, poured concrete inject Go Eat with a contemporary sheen. The restaurant’s combination of single and long communal tables immediately evokes the convivial atmosphere for which Spain’s tapas joints are renowned; a more obvious nod is found in the long bar lined with high stools and an accompanying food display counter. And then there’s the art: numerous reproductions of early 18th century paintings by the likes of Henri Rousseau, Amadeo Modigliani and Schiele Egon which fill the space with an undeniable burst of Europe in Asia.